I’m not sure what I’ve gotten myself into. Prior to our holiday, we went to a demo day at Durham Forest. Hubs wanted to check it out for mountain bikes for me, and I wanted to check it out to see what the fuss was about. Hubs had purchased a mountain bike, but it wasn’t the same as when he purchased a road bike in that I wasn’t jumping on board. But here’s the thing… hubs doesn’t have any friends that mountain bike, and I don’t want him doing it solo. I’ve listed people he could/should ask, but he’s not interested. So of course I’m feeling terrible that he isn’t getting a chance to get out (even though I’ve even encouraged him to go out with the staff that sold him the bike). I’m sure this has secretly been his plan, to make me feel sad for him. I started reading blog posts about women who joined the sport. I decided that if I was going to do this, I’d only do it if I could take some lessons, and not from hubs. Turns out he wants to take lessons too. I also was very hesitant about purchasing a bike because I have no idea if I’ll even like mountain biking, hence the demo day. Let’s talk about the demo day, shall we? From the posts I had read, the only bike that seemed remotely interesting to me was the Juliana, simply because of the name. 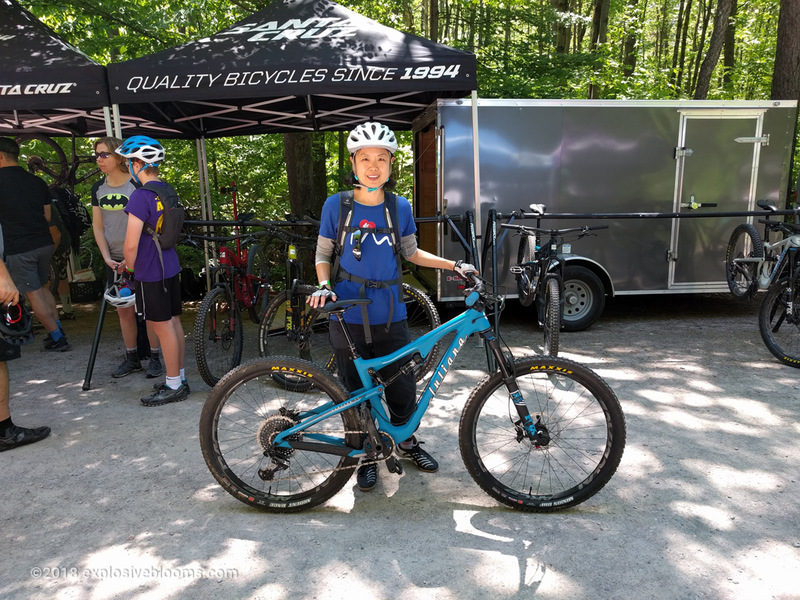 At the demo day, the first bike I tried was a Rocky Mountain, which was too big, and the suspension wasn’t set correctly for my weight. Add to that, we ended testing it out on a technical course that was way too advanced for me and this was my first time out (other than my morning in Moab). Because it was a demo day, the single-track course was really busy. Let’s just say it was a terrible experience and there were some tears involved. When we finally got off the course, I said I was done. 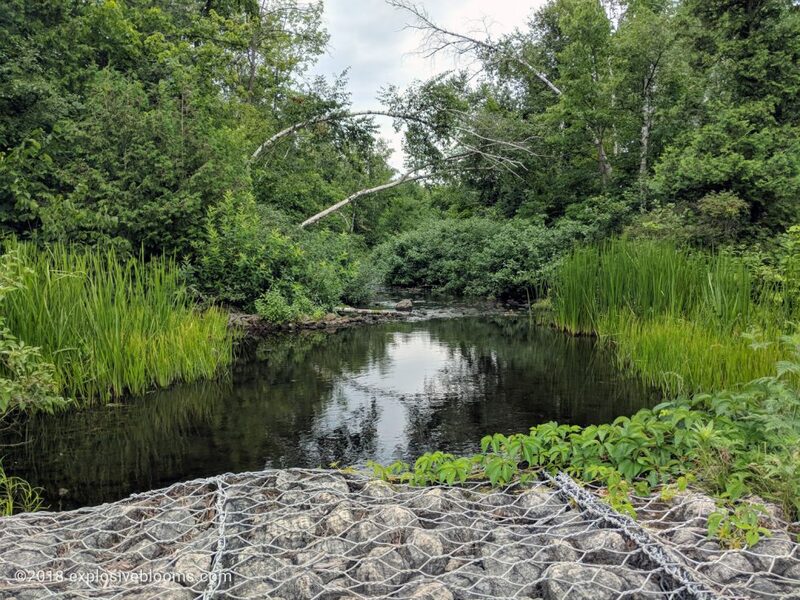 I returned the bike and walked away – I needed some time to calm down. I texted my best friend and told her how horrible it was and how upset I was. Writing out my feelings helped me to process my emotions and I decided we had driven so far, I’d give it another shot, as long as the next bike was in my size. I’m sure this was a relief for hubs to hear. We walked by one of the tents and I saw a Juliana! So hubs encouraged me to try it out. The fitting process already started out much better. The mechanic whispered, “how much do you weigh?” After I told him, and told him about my first experience, he reassured me that I would love this ride. Love it I did! It was like riding my road bike, but on trails. 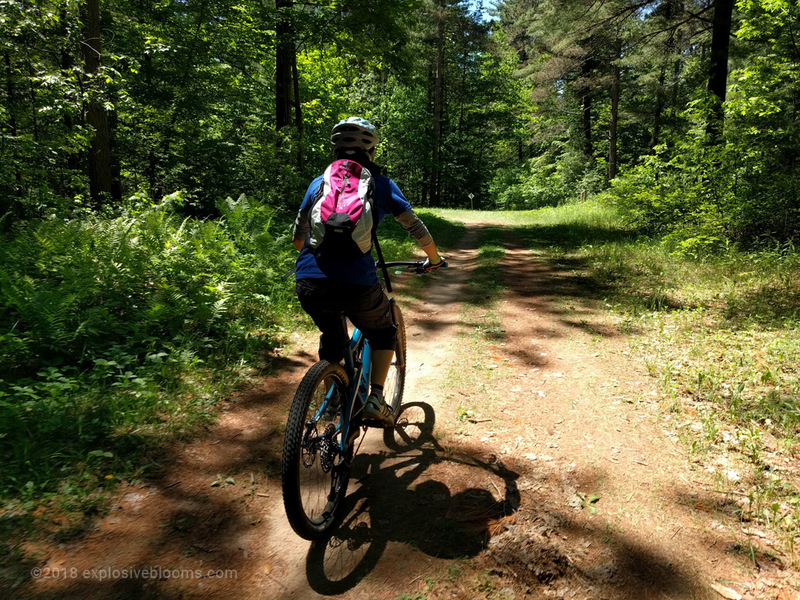 Oh, I should also mention that while I was calming down, hubs had found a much simpler trail for us to ride – wide and flowy, with much fewer technical elements. The Juliana rode like a dream – it was smooth and comfortable. I was totally in love. Not surprisingly hubs later told me it was a $10k bike. Ouch to the price tag! The next bike I tried was a Norco C2. 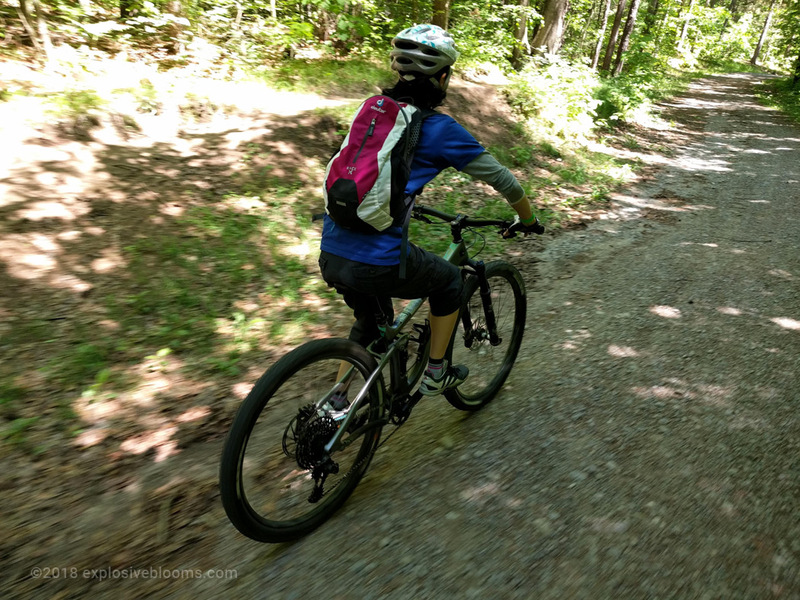 It also felt better than the Rocky Mountain, but it felt like more bike than the Juliana, and it turns out that the Norco I was riding had bigger wheels (explaining why it felt like more bike). It felt less agile, but overall, it was still not bad. I left the demo day all smiles. The tears from earlier were wiped away. I’m lucky to have such a supportive husband, a man that finds ways to set me up for success, like knowing that the first trail was not suitable. He also knows when to jump in with advice, and when to back off and give me the space I need to figure things out for myself. I wasn’t expecting to get a mountain bike this year, but post holiday, hubs jumped back on the mountain bike thing so very recently, I made a purchase. We (he) originally was looking at the Norco A2 for me, but the shop didn’t have any small Norco bikes for me to test ride. They got me on a Rocky Mountain medium (reliving the bad memories) and of course I didn’t love it. They could order in the correct bike, but I’d have to put in a non-refundable deposit, and I wasn’t willing to make that type of commitment. 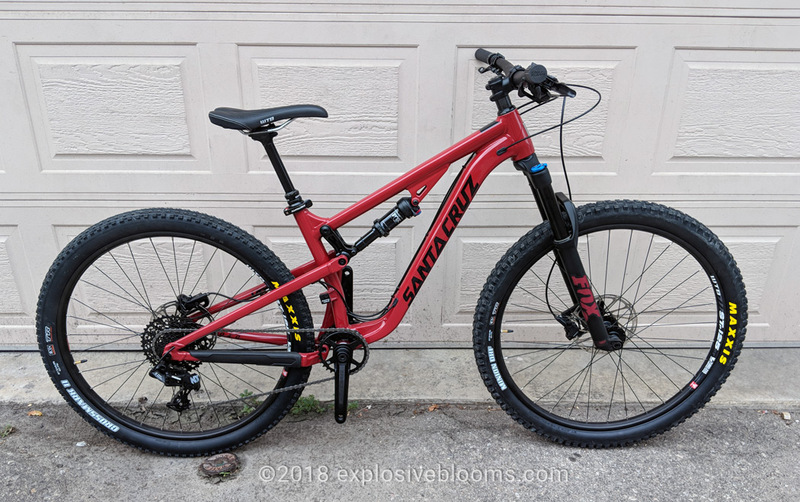 I asked hubs about the Juliana, because he said there was a cheaper version (aluminum vs carbon), but even the aluminum is pricey, but hubs told me there was a store having a sale on the Santa Cruz (same maker). The frame geometry was the exact same as the Juliana, he said, thought the Santa Cruz is not a “girl” mountain bike. Apparently the store had one size small in stock that I could test ride. We zipped over and I took it for a spin and it was a fun ride (I learned the lingo is “playful”). Hubs and I spent about 20 minutes talking about this bike versus the Norco A2 and we both decided that Santa Cruz was the better bike for me. Even though it’s a unisex bike, I refer to it as her. She’s pretty. But seriously, what am I thinking?! I’m still not sure I’ll love this sport. I reminded hubs that I would only do this if I could take some lessons, but he convinced me to ride once first, before taking lessons, just so I at least have a feel for the bike. Makes sense, so today we packed up the bikes and headed for Hilton Falls. My bike goes in the trunk, while hubs’ bike was racked on the roof. I was so nervous, but there weren’t a lot of riders on the trails we were on. Although the first trail we were on was rated green (easy), there were still some parts I had to dismount and walk through. We did the loop a few times, and there were some parts where I initially couldn’t do, but eventually got, and there were parts I just wasn’t brave enough to attempt at all. This is why I want the lessons!! Being familiar with riding a bicycle, I have no issues with changing gears. 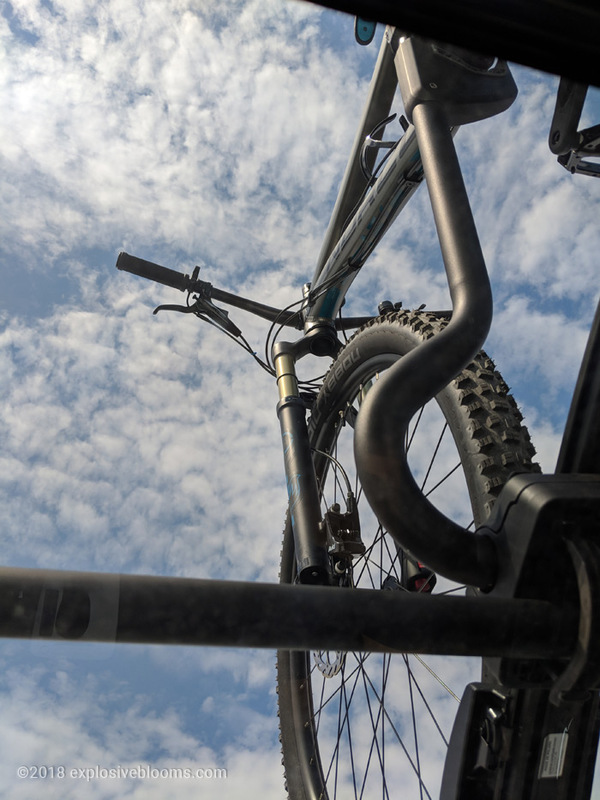 In fact, I love that gear changing only happens on my right handlebar – I don’t have to worry about changing my front gear at all. What I haven’t figured out yet is when and how to use my dropper post. I want to learn about body position, hand position, and choosing lines. I want to learn about braking, control, and recovery. I’m pretty good at remembering to level my pedals (what Eric taught me in Moab). Overall, I’d say it was quite thrilling, even though I did have to hike a number of sections. But I want lessons, and I see value in lessons. After the third time doing the loop, I was done. My body was exhausted, which means that my muscles slow down and I can tell my focus starts to wane, and that’s dangerous and can lead to accidents/injuries. My wrists were sore as was my tush (I didn’t wear padded shorts, and maybe I should). I’m sure hubs could have done more riding, but 25km is all I could muster today. I do still love road cycling, more so than mountain biking, but I can see how this is an interesting change. It’s a full body workout for sure, and it’s less hot when you’re under a canopy of trees versus on wide-open roads. I’m willing to take some lessons and try again, though I’m hoping that this won’t mean that hubs will stop road cycling. I’m actually going to try to get us on the road tomorrow. After we packed up the bikes, we picked up some groceries on the way home. I was craving fish. I love our weekend dinners! Tonight we grilled up a whole trout (stuffed with pineapple sage and lemon thyme from my garden, lemon and onion). 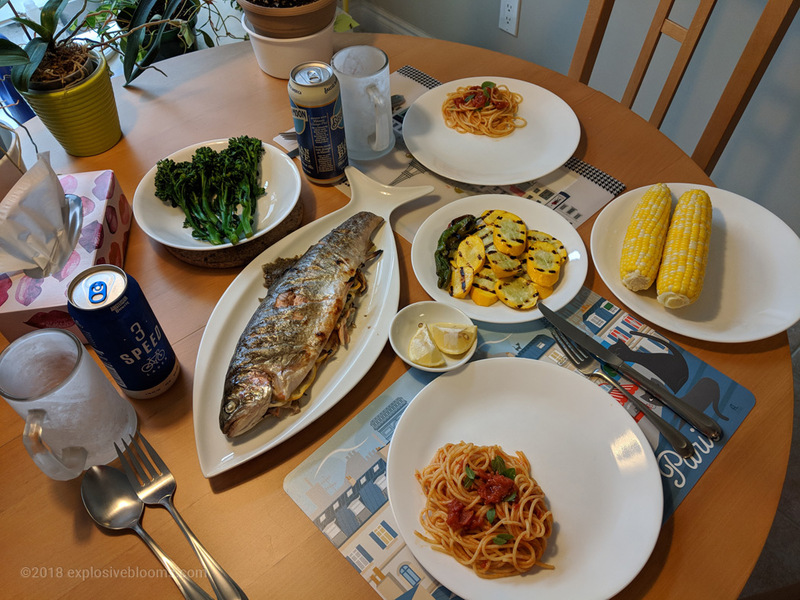 We had corn, broccolini, grilled zucchini and shishito peppers, and spaghettini with leftover tomato sauce. My belly is full!